A week long drama of finding, misplacing, relocating and detonation of World War II German bomb by The Royal Navy has come to an end. Here are the events. 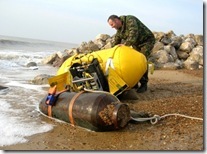 A 500 kg German bomb of Second World War,was found when a contractor working on sea defences off the Felixstowe coast. 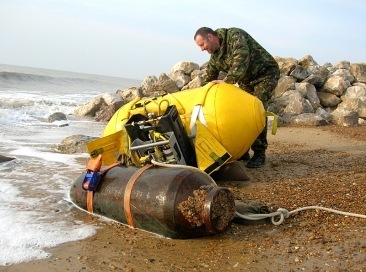 The bomb is believed to be mostly of TNT dynamite mixed with about 30 % aluminium powder to make it lethal and is one of the largest ever washed up on British coastline. The bomb was powerful enough to flatten a large area of the seafront and cause collateral damage up to about half-a-mile inland. More than 1,000 residents were temporarily evacuated from their seaside homes. A team of Royal Navy bomb disposal squad towed the bomb out to sea to safely detonate it. A sea exclusion zone was then set around the bomb to protect local shipping. 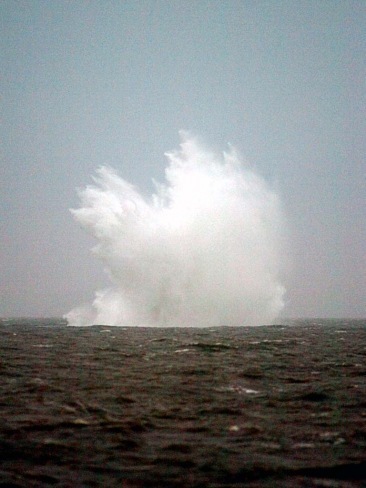 The Navy team had planned to carry out a controlled explosion of the bomb, but strong tidal currents made it impossible for divers to attach an explosive charge. In the process due to bad weather and strong currents the bomb was temporarily misplaced in the sea through mechanical and technical mishaps. The ten men diving team carried out 14 dives using sonar and GPS but due to bad weather the bomb could not be traced. The bomb was about two miles offshore in 10 to 12 metres of depth in water. The divers were on a dangerous mission to locate the bomb in absolutely nil visibility and were searching for the bomb with just their hands and fingertips. Unmanned Underwater Vehicle (UUV), Remus with side scan sonar was deployed to locate the bomb and search efforts were doubled. Remus was deployed twice daily for the last five days to conduct a meticulous and comprehensive search of the sea-bed and has covered 14 nautical miles within the 2km x 1km search area during optimum tidal windows. The bomb was located and was successfully detonated. Detonation occurred at 1940 after an earlier misfire at 1915. Hundreds of people braved strong winds and heavy rain to witness the event. Video clip is here at news.bbc. Finally Royal Navy has succeeded in their mission.